Hello, and welcome to the Everton Easter sermon. And on the Sunday He was resurrected. In a similar way, our season looked to have died out on Wednesday night. But by Sunday there’s every chance that it could be resurrected. What we need is a Goodison blockbuster to raise the spirits. And would you look at that? Manchester United are coming. The Moyesiah returneth. There’s so much to talk about, but seeing as you lot must have the attention span of Magaye Gueye when left alone with a phone, I’ll keep the Moyes talk short. There’s been an awful lot said by him and more recently by Phil Neville which is just plain dull. You’d think that venomous dirge of United cockiness might take a while to seep into the new men, but Moyes started with that £28m joint offer for Baines and Fellaini. That’s Manchester United behaviour. He also did a great job turning us into a side that can look at a 7th place finish and moan. So the conclusion is this – give him an ovation? Fair enough. Boo, jeer and mock? Fair enough. We know Moyes and we know Everton. Frankly, he deserves a bit of both. He who concedes to Cameron Jerome deserves all bad things. It was just a disaster on Wednesday. The goals were all soft, the team was tweaked too much, and Crystal Palace didn’t actually have to do all that much to beat us. Ross Barkley is always a danger to himself when placed in a deeper position, because the mistakes he can afford to make in their third cannot be made in ours. Yannick Bolasie made Mirallas and Deulofeu look s***e, which is ridiculous, and we were punished. Simple as. You want to give up on the season now, do you? Incredibly I wrote the same rebuke after the defeat to Arsenal in the FA Cup. In fact, here’s a good ol’ copy and paste for ya. “People who have given up on us should be given up on. I just read a comment saying “Ive given up on watchin bills also rans”. I’ve found we adopt a defeatist attitude very, very quickly – see the reaction to the weekend’s defeat – and it’s tough to take. Why do people work poor hours in awful jobs through the week and then get to the weekend and moan endlessly about football, the saving grace? Yes, Everton lost. But it distracted you from the fact you’ll be up at 7 on Monday to stack shelves for a whole ninety minutes. Funnily enough, I wrote that when we were twelve points behind Arsenal and freshly knocked out of the FA Cup. Now we’re one point behind a side we know love to mess up in great positions and with four games left to play. I’m carrying on. And I guarantee if you give up on us now I’ll have more fun than you. @EvertonArentWe It'd be more fun if whenever Fellaini touches the ball, someone yells "TWENTY SEVEN POINT FIVE MILLION" and everyone laughs. @ViewFromGwladys David Moyes smells like twiglets. Steven Naismith is Maradona reborn. Alright, the focus is on David Moyes and his musky aroma, Steve Round and his headset, Phil Neville and his Kit Kats, Marouane Fellaini and his aura of despair. But also it’s about getting stuck into Manchester United. Let’s not forget these righteous self-loving “We prefer you to Liverpool” snides have toppled off their perch and aren’t enjoying the view from down in seventh. A victory against them would secure our place above them while edging them ever closer to a season of having to watch Hull in the Europa League. Who writes these scripts? They’re beautiful. What’s worrying about this United side? De Gea is quality at those reflex saves Tim Howard was doing while he was still throwing toys from his pram (in the baby sense rather than like David Moyes). Phil Jones will spend ninety minutes looking jealously at Seamus Coleman and making daft faces for LADBible to giggleLAD aboutLAD, Patrice Evra will probably be whining too much to pay attention to the galloping Irishman, while the centre of defence could be made up of everyone’s least favourite dinosaurs, Ferdinand and Vidic, or possibly Smalling. The midfield’s also a bit hilarious. Fletcher. I like Fletcher. Ryan Giggs has gone a bit past his sell-by-date and is smelling a bit off. Possibly the same for Fletcher actually. Ashley Young’s a scary bedtime story told to kids who think cheating is cool, Antonio Valencia’s like James McCarthy without the direction or use, and…ah. Marouane Fellaini. You’ve taken a wrong turn lad. The attackers hold the key to any United success. Juan Mata’s many levels of boss, as is Wayne Rooney, and I won’t hear anything to the contrary. 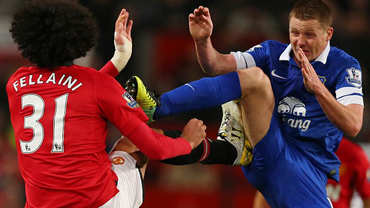 Of course Rooney’s a badge-kissing granny-loving potato-headed ****. Mentioned it again didn’t I. Januzaj and Welbeck are great and could cause damage…according to some very optimistic United fans. I don’t see it. Hernandez can be lethal though, and Kagawa is a tricky customer. They’ve scored four goals in each of their last two Premier League games, and they haven’t played for almost a fortnight. But they’ve never liked coming to Goodison Park. There’s a good reason for that – the players don’t like them, the fans don’t like them, and we love to remind them of that fact. Sin Miedo. So which Everton side plays? Howard needs to forget about Wednesday and live up to his shiny new contract. Coleman, Stones, Distin and Baines will probably stay together, but Stones will not get as much time on the ball as against Newcastle or Fulham. He’ll have to adapt. Ah, McCarthy and Barry together again. Thank heavens. In front of them will be Barkley…er….Naismith? Osman perhaps? McGeady was alright at times against Palace. Mirallas and Deulofeu not so much. But they can still create. Lukaku needs to learn to keep it up for ninety minutes. So, this is one part classic encounter with an old rival at the Old Lady, one part face-off with our ex-manager and his cronies. It should be a cracker, and with any luck Goodison will be rocking. 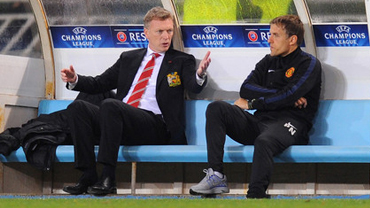 Remember, kids – he’s not the Moyesiah. He’s a very naughty boy. In the name of the Harvey, Kendall and Alan Ball…Amen. Is right. The defeatist attitude after the palace game was absurd. And the frustration shown with our new style of play makes me wonder exactly what is it that evertonians expect? Of course I want us to win every game and was left frustrated but I’m not giving up. We’ve been boss to watch this season.